In a large soup pot on medium high, add all the ingredients (except for garnish ingredients). Season with sea salt and black pepper, cover and bring to a boil. Reduce heat to low and simmer for three hours. Turn off heat, remove chicken from pot. When cool enough to handle remove all the meat from the chicken (no skin) and add to the soup. 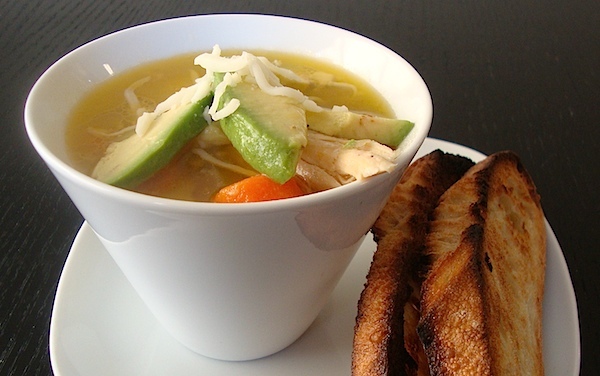 Bring to a boil and serve hot with slices of avocado on top and sprinkle with Mexican cheese. This sounds absolutely delicious! Very fresh and light. It's such a happy soup ... all colorful and pretty! It sounds so delicious, Mia. I might have to make it for my daughter; she's all stuffed up today!